Home > Advice > Apprenticeships > Higher apprenticeships: Should I do one instead of university? Higher apprenticeships allow you to train for a highly skilled job. Unlike university, you don't have to pay – in fact, you'll get paid a wage by your employer. You'll learn by doing the job you're training for, and study for qualifications along the way – you could even finish with a degree. In this guide we answer all your questions, including firstly What is a higher apprenticeship?, before moving on to the different roles you cold train in. Like all apprenticeships, a higher apprenticeship is a training programme which you carry out in the workplace. The difference is, you will train for a highly skilled job that might only have been open to graduates before higher level apprenticeships were introduced. They span level 4 apprenticeships (equivalent to a foundation degree) all the way up to level 7 (equivalent to a master's degree). But as one aerospace apprentice puts it, a higher apprenticeship is "a more practical way of learning than being taught from a book". As an apprentice, you will work as an employee of the company you're training with. This means you'll get paid as you do your apprenticeship. So could I take a higher apprenticeship instead of going to university? Yes. 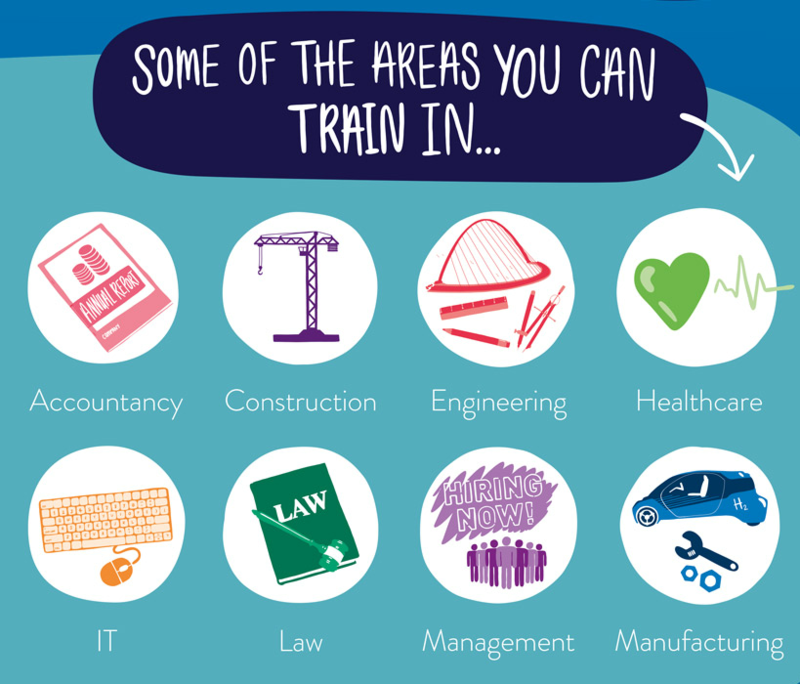 While you still need to go to university to train for certain jobs, like being a doctor or teacher, higher level apprenticeships could help you qualify as an engineer, a trainee legal executive, a bank branch manager or even an airline pilot. You may even study for a degree. Courses usually start out as level 4 apprenticeships, which means that in the first instance you'll work towards a foundation degree. However, on a higher level apprenticeship, some employers will give you the chance to do a full "honours" degree, the same as you get at university. Like your other qualifications, your degree will be linked to the job you're training for. Get help deciding: Should I apply for an apprenticeship or university? What types of jobs can I train for? New schemes are being launched all the time. For example, the first space engineering apprenticeship in the UK was launched in early 2014 and one is being designed for sustainable building technologies. And there are thousands of higher apprenticeships vacancies on offer for 2018, in areas including engineering, aerospace, cyber security, nuclear science, business management, data analysis, HR, finance and media. What's the difference between this and other types of apprenticeships? Apprenticeships come at different levels, depending on the type of work you want to train for, and you can read all about the different types on our apprenticeship page. At the very least, higher apprentices work towards level 4 apprenticeships, which means you'll complete your course with the equivalent of a foundation degree or above. An advanced apprenticeship is equivalent to A-levels. How much does it cost to train for one? As long as you're under 24, you won't have to pay a penny. In fact, as an employee of the company you're training with, you'll get paid a wage. Training costs are paid for by the government and your employer. How much do higher apprentices get paid? This is the least you can be paid. Because higher apprenticeships are working towards more advanced qualifications, you can expect to earn much more than that. According to a government report, the average hourly wage for higher apprentices in 2016 was £10.80, and the top jobs can pay up to £25,000 a year at the start. You’ll need at least five GCSEs at grade 4 / C or above (including maths and English). As well as this, you'll usually need something called a "QCF level 3 qualification". In plain English, this means A-levels (highers if you're in Scotland), a BTEC, or another type of apprenticeship such as an advanced apprenticeship. If you've been to sixth form, you probably have a level 3 qualification. You can start any apprenticeship at 16. If it's a higher level apprenticeship, you need to have a level-three qualification, which means that in practice, you’ll probably be at least 18 when you start, the same as with university. Like intermediate and advanced apprenticeships, you’ll do most of your training on the job. On top of this, you'll spend around a day a week or a set block of time studying at a university or college. You may have to take some exams too, depending on what you do. I've heard of something called a degree apprenticeship. Is it similar? In some ways, yes. The difference is, you will always study for a degree in a degree apprenticeship. A degree is only part of some higher apprenticeships. If you like the sound of them, you can learn more about degree apprenticeships here. One easy way to apply is to visit the government's GOV.UK website and set up an account. Once you've done that, you can search for different types of apprenticeships. When you've found one you like, just follow the instructions. 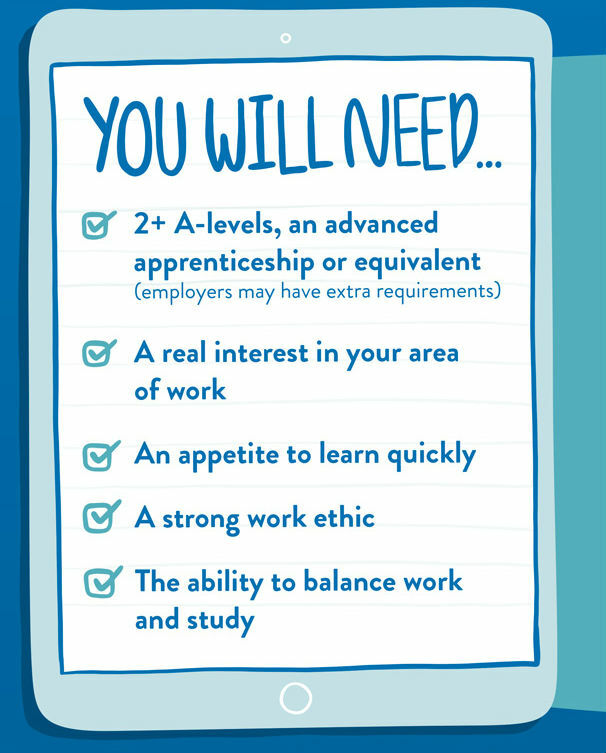 Check out how to find an apprenticeship for more help. And don't forget to make the best of your careers adviser! It's just a few minutes long and has loads of great interviews with young people studying for higher apprenticeships today.